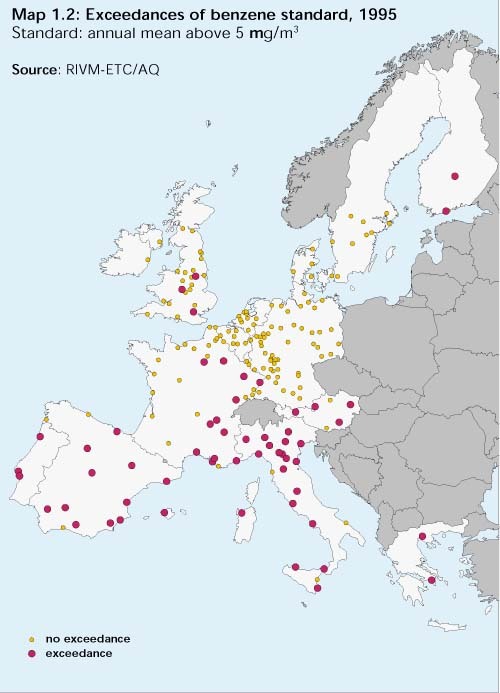 Although air quality has improved in recent decades (and particularly in the large urban areas), nearly all urban citizens still experience exceedances of EU urban air quality standards. Note: Figure indicates . potential exposure. as estimates are based on the assumption of exposure for a person permanently in ambient air (i.e. not taking into account the indoor exposure). Note: PM10 is the fraction of suspended particulate matter sampled with sizxe-selecting device with a 50% efficiency at an aerodynamic particle diameter of 10 micrometer. Meet EU air quality standards (see Table 1.2). Exceedances of EU air quality standards for benzene (C6H12), carbon monoxide (CO), lead (Pb), nitrogen dioxide (NO 2), ozone (O 3) and particulate matter (PM 10). Population exposed to exceedances of (proposed) EU urban air quality standards. Note: Measured values were found to have insufficient spatial coverage to estimate potential exposure to air pollution of the urban population in the EU. Exceedances of limit values were therefore calculated using a model developed in the Auto-Oil II programme (EEA, 2000). By combining calculated values and population data, an estimate was made of potential exposure, i.e. the exposure of people if they are in ambient air 24 hours a day. The transport sector is a major source of air pollution, and the dominant source in urban areas, having overtaken the combustion of high-sulphur coal, oil and industrial combustion processes. Exposure to air pollution can cause adverse health effects, most acute in children, asthmatics, and the elderly (WHO/EEA, 1997), and can damage vegetation (foliar injuries and reductions in yield and seed production) and materials (notably, the cultural heritage). 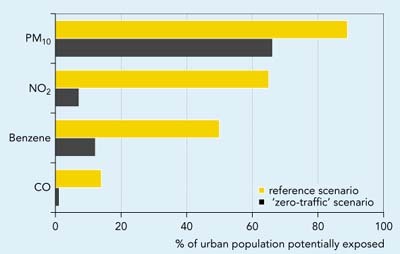 Within the transport sector, road traffic is the most important contributor to urban air pollution. While national and EU regulations aimed at automobile emission reductions (such as the introduction of catalytic converters or unleaded petrol) have resulted in considerably lower emissions per vehicle, the continuous expansion of the vehicle fleet is partly offsetting these improvements (see Indicator 2). Community policies to curb air pollution from road traffic have been framed around the Auto-Oil Programme I (which is now completed) and the Auto-Oil Programme II, with its proposed follow-up programme . Clean Air for Europe. . At the international level, various protocols under the Geneva Convention on Long Range Transboundary Air Pollution (CLRTAP) set emission reduction targets for specific pollutants in the form of National Emission Ceilings based on a cost-effectiveness analysis. The Commission has proposed slightly stricter National Emission Ceilings based on its acidification and ozone abatement strategy. The United Nations Framework Convention on Climate Change is also relevant since measures to reduce emissions of greenhouse gases from fuel consumption will at the same time reduce emissions of other compounds. Several air quality limit values for ambient concentrations have been set to protect human health. Current EU legislation (the EC Framework Directive on Ambient Air Quality and management (CEC, 1996a) and related daughter Directives) is based on WHO-recommended threshold values. Although air quality in Europe (and particularly in the large urban areas) has improved in recent decades, nearly all urban citizens still experience exceedances of the limit values listed in Table 1.2 (Figure 1.9). 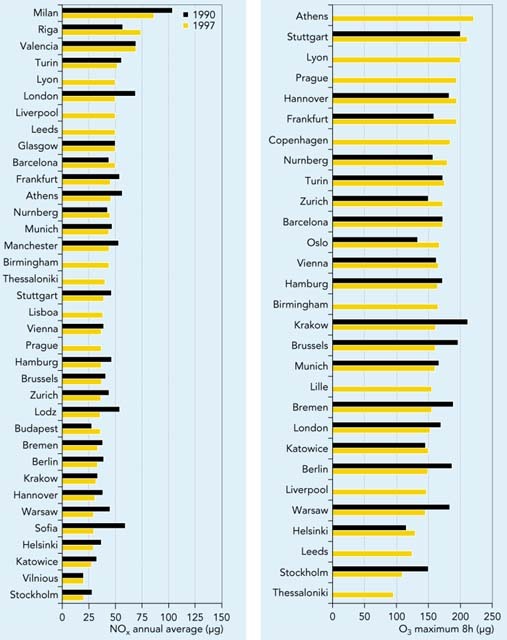 About 90 % of the urban population experience exceedances of both the 24 h and annual average EU objectives for particulate matter. Exposure to exceedances of NO2, benzene and ozone are also frequent. The EU air quality limit values were exceeded in 1995 in most European cities, however peak concentrations are decreasing. In most larger cities the average city background concentrations, representative for the urban area at large, exceeded EC proposed limit values (Figure 1.10). 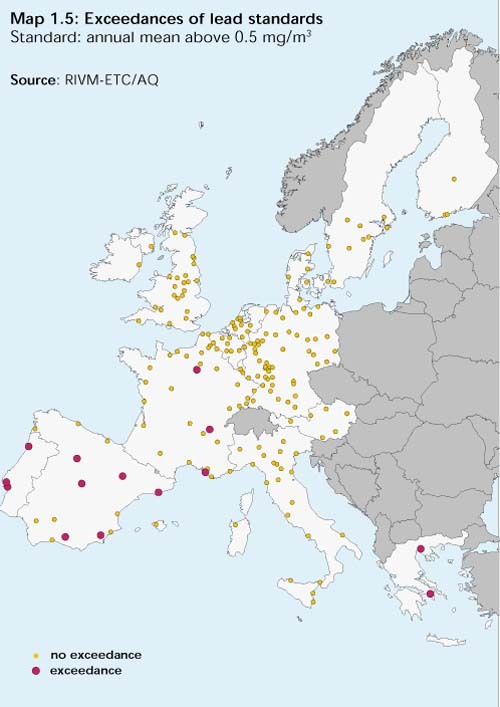 From the limited data, the highest concentrations appear to occur in some southern European cities (Map 1.1). In 1995 about half the urban population of the EU was exposed to benzene levels in excess of the proposed EU limit value. The largest exceedances are found at street level and in car parks. Validation of the benzene calculations with measurements is hampered, partly by the scarcity of data (none of the EEA member countries has submitted benzene data to the European database AIRBASE ) and partly because measurements are frequently made at stations near traffic routes whereas the calculations are intended to be representative of the overall urban environment. Nevertheless, there is reasonable agreement with measurements. Exceedances most often occur in the more southern countries (Map 1.2). The highest contribution of traffic to total benzene emissions is also found in these countries. Urban air concentrations have clearly fallen during the past decade. Exceedances of the objective (8-hour average of 10 mg/m3) have been calculated for 11 cities (14 % of the total urban EU population in all the cities that were included in the modelling). 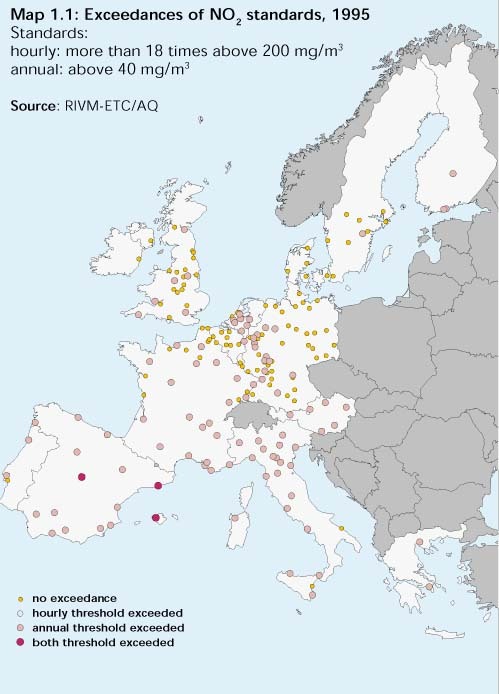 Most exceedance were found in the southern Europe cities (Map 1.3). The EU limit values (both for the annual and for the daily PM10 concentrations) are frequently exceeded by a large margin (Map 1.4). Data is currently insufficient to draw firm conclusions about emission trends. However, concentrations of total suspended particulates (TSP) and black smoke are generally decreasing. 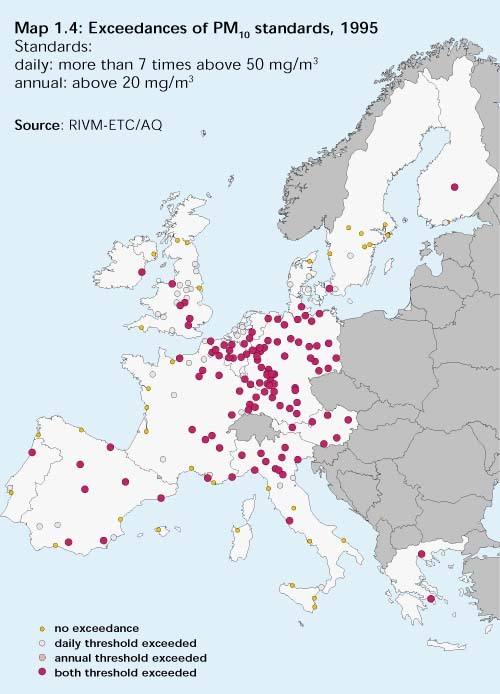 PM10 concentrations are expected to remain well above limit values in most urban areas of EEA member countries in the coming decade. This suggests that more measures need to be taken to reduce human health risks significantly (CEC,1999c). Episodes of ozone exceedance occur over most parts of Europe every summer. The reduction in emissions of ozone precursors (NOx, NMVOC) achieved in the EU has not yet been sufficient to make a significant difference to health risk. Threshold values set for the protection of human health and vegetation are frequently exceeded by a large margin (Figure 1.10). Insufficient data and strong year-on-year fluctuations owing to episodes of high ozone concentrations preclude clear conclusions on time trends. However, the limited monitoring data suggests that peak concentrations are decreasing. Despite projected further emission reductions, ozone concentrations are expected to exceed EC threshold values over all EEA member countries in the next decade (EMEP, 1999). By 2010, north-western European areas are expected to comply with the proposed EU target value of only 20 exceedance days per year in the long-term air quality objective (CEC, 1999a). Urban lead concentrations have decreased in the past decade. 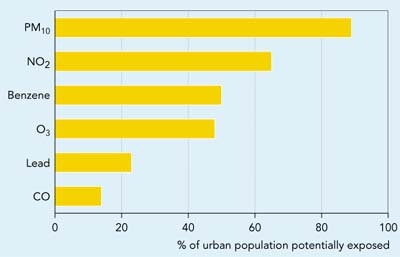 In 1990, 23 % of the EU urban population could have been exposed to ambient levels in excess of the limit value of 0.5 m g/m3 annual average, as estimated from the cities covered by the calculations (Map 1.5). While the transport sector is an important source of many of the pollutants discussed above, the same pollutants also come from many other sectors. No data is currently available on the relative sectoral contributions to air pollutant concentrations. However, the EEA. s Generalised Empirical Approach, which is being developed and applied in the context of the . Clean Air For Europe. programme, has provided a methodology for estimating the transport contribution to urban air pollution. Figure 1.11 shows some preliminary results using this methodology, assuming zero pollution from road transport in a given city. Under this assumption, exceedances of threshold values for typical transport-related pollutants like NO2, CO and benzene would decrease dramatically, but there would be less impact on PM10 levels, most of which result from particles transported over long distances. For references, please go to https://www.eea.europa.eu/publications/ENVISSUENo12/page008.html or scan the QR code.